Are you still with us, with all of this intensely indigo gabbing? Spurred on by comments and emails, I have a few more things to add. 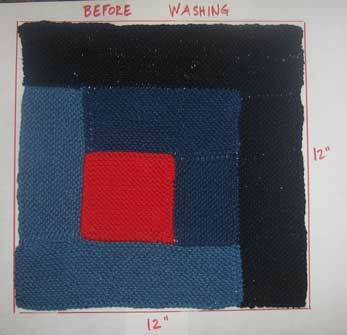 On Denim Blankets: Will a Square Stay Square? 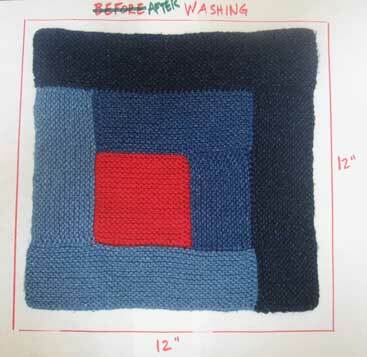 Readers want to know whether a square knitted in denim would stay square after shrinking. The answer is: it depends on the construction of the square. Bottom Line: log cabin squares? They stay square. They don’t ripple or do anything unsightly after you wash them. Mitered Squares? They stay square enough. I know both of these things from personal experience. Other types of squares? Not so clear that they will stay square after washing, especially if they are knit all in one direction from cast-on to bind-off. Depending on their size and the degree of shrink achieved, they may become squashed squares, also known as rectangles. If they are knit on the bias, they may become squat diamonds. For squares other than log-cabin or miters, I must counsel the washing of a sample, the saying of a prayer and the development of a Plan B.
I went digging in my photos and found that I had already given excessive scientific inquiry to this subject, and totally forgotten about it. These photos prove: (a) that a log cabin square will shrink evenly in both length and width and (b) that I have a lot of time on my hands on a Sunday afternoon. I rest my case. Log Cabin squares shrink square. What about denim miters? Do they have square fidelity after washing? The answer is yes, and we have proof. We have the Taro Blanket. It’s denim miters. They appear to be square. Square enough. We also have Belinda. Belinda knit a queen-size mitered square blanket (seen here as the background for knitting-in-progress), using the pattern in our book, in denim remnants that she had from a previous life supervising handknitters who were making hundreds of Gorgeous Denim Jumpers That I Would Kill For If I Ever Saw One On eBay. I slept under it for several nights without detecting asymmetry of any kind. I think this is rock-solid proof that it is safe to knit mitered squares in denim, and also that we should all do just that. Oh Sure, It’s Schnell, But Is It Trendy? Mary de B reported that she had seen a bunch of Schachenmyr/Nomotta “Blue Jeans” yarn in a sale bin. She wanted to know if it is true denim yarn and therefore, naturally, she should stop whatever she is doing and go buy it all. This led, eventually, to a recollection of this post. It seems I have already knitted with this yarn and that it is in fact true denim–it shrinks and fades. HOWEVER, check the weight and recommended gauge of the yarn before committing to it. It comes in a heavyweight version, which is very chunky indeed. It also comes in a DK weight which is a little lighter than Rowan or Elann–you get 20 more yards in the 50 gram skein, and the recommended stitch gauge is 6 stitches per inch. Personally, I would knit it to 5 stitches per inch and consider it a fine substitute. I want to thank Mary de B for reminding me of how much I love all things schnell und trendy and certainly anything with the slightest jeanseffekt. Rowan recommends that before a denim sweater is sewn up, the pieces should be washed and dried, and that you should also pre-shrink the yarn that you are going to use to sew up the sweater. I believe that these recommendations are unnecessary. I usually do wash and dry my pieces before sewing up, but only because I want to. I’m eager to see the transformation of the fabric that comes with washing, the fading helps me see my sewing better, and the edges seem to be a little smoother. But it’s not necessary. Do it only if you feel like it. That bit about pre-washing the sewing-up yarn really gets my goat. No wonder knitters hesitate about trying the yarn, if it requires such fussing! Washing yarn is a pain in the neck. The cut ends are going to fray, and even if you skein it up neatly, it could become a tangled mess in the wash. The only thing that you achieve is a bit of shrinkage that is absolutely not going to affect the strength or appearance of the seams in your garment. (The shrinkage is only material when the yarn is knitted up into FABRIC; not when it is being used as a single strand of string.) I say this with all the passion of my being: PISH TOSH. Don’t do it. There is more good news, though: the shrinkage of the fabric ensures that the ends, which do fray slightly on the wrong side of the garment (where you have woven them in), are shrunk tightly in place and are not going to undo themselves. But these are the Big Three. Rowan Denim (which may be out of print; I didn’t even see it at the Rowan website, and I had a mild moment of panic when I couldn’t find my copy) has divine gansey-based garments, for adults and children. HOWEVER, the book dates from the early 90s, when it seems that folks liked to climb three at a time into a single sweater. Once, I started a child’s sweater from this book for Joseph, who was 6 at the time, and as I was working the bottom of the back, I realized that if I translated the number of stitches on my needles into inches, the sweater would be a very roomy fit for ME. These sweaters need some adjusting to the current preference for single-occupancy clothing. Denim People. This more recent book has great modern sweaters, jackets and tops, and some especially nice things for men. Martin Storey at his best. No traditional Arans, though. 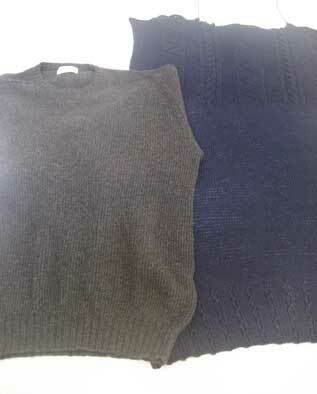 My personal fave: Indigo Knits by Jane Gottelier. A great mix of traditional ganseys–rendered exquisitely and sized nicely–and more high-fashion clothing and accessories suitable for your appearance on The Sartorialist. I’m going to be knitting from this one forever. The Aran Armchair Cover. She’s mad–MAD–to specify wool for this one. It would felt and mat! I’m doing mine in inky doubled-up denim, and it will get all kinds of cool wear marks, and sun marks, and it will be my favorite thing ever. I need to find the victim chair and git busy. I am not getting any younger. I think that’s all. For today. We can talk about something else if you want to. Hey! I don’t think that’s very nice to flaunt that Outside the Lines book when I’m sitting here in a pool of sweat waiting for my pre-ordered copy… Plus I have 40 skeins of Elann’s denim sitting on the counter waiting to be made into something. I need that book!! Pish Tosh indeed! Even Tish Pshoar Nonsense as Blackadder would say. There is no need WHATSOEVER to wash yarn to sew up with. I know, as I supervised (as you say) hundreds of knitters, who all knitted things, sewed them up, sent them back and then I would set off in the company Renault Espace to get horribly lost driving through Mile End to Denim Services, where Izzy and Meta would then stonewash (with real stones) said finished sweaters. 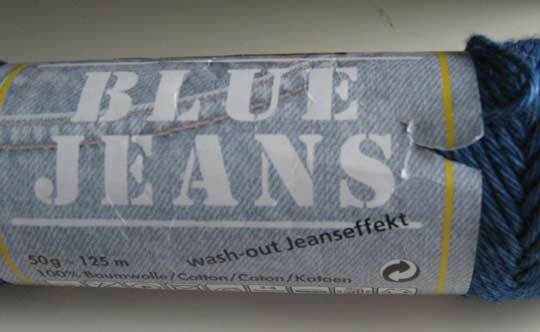 This did not result in hideous 1980s-type jeans wash, just nicely broken-in knitwear. And we never worried about the sewing-up yarn shrinking differently and no-one ever commented on it. We did once pick a load of stuff up and as Meta was taking it out of the dryer an army-surplus gun fell out (loaded) – they also overdyed Eastern European surplus stuff and this had been left in a pocket. The police thought it was all great fun and although they wouldn’t let me keep the gun itself, they did let me have a bullet. And as for the doubled-up chair cover, can we fight to see who gets to sit on it first? Or should we have a knit-a-long…. So glad to see you referenced my blanket, it is waiting for the next time to keep you warm. Thanks for all the helpful comments about working with Denim. I usually wash/block individual sweater pieces too – mainly because I find it makes sewing up so much easier. But the idea of partially assembling & then washing seemed unnecessary & burdensome. And, I realize that I actually have most of those books. I am confused, however. I thought you only had one book available so far & that your second book wouldn’t be out until fall. Is it available now? Do you have a previous book that I don’t know about? I am off to BN to see if they have it (I just got a 10% off email coupon from them). Aha – I see it’s not available until Sept 16 but at least I can pre-order it. I appreciate all the going-on about knitting with denim because until you got started on this theme, I thought denim was simply a COLOR of yarn, not something separate with its own characteristics and patterns made specifically for it. The chair cover is insane. Can’t wait to see it. What’s next…Rowan Denim sails for the boat? That chair cover is awesome! 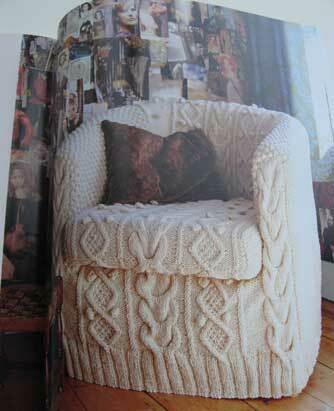 I am also planing on one day making a Aran Armchair Cover!!! In fact I bought this book because of this pattern and this pattern alone. I have an Ikea tub chair (as in the pattern) and had always wanted to sew a slip cover for it (one new years eve I got black silly string all over it and it stained badly) but my sewing skills are not much up to par. When I saw this I totaly freeked, bought the book and then called every one I know (they of course thought I was crazy) and bought a 5.5 lb cone of cotton yarn on ebay (I also thought wool would not be that great, more on the comfort/itchy side of it for me). The yarn is cream and I’m very tempted to dye it, maybe I should take a stab at indigo (is this really hard?) I also loved the bean-bag chair and have been saving all of my hubbys old jeans but can’t quite take the plunge into buying that much denim yarn, every thing I have found has been a bit exspensive for my taste. Are you really going to knit the Aran Armchair Cover? Really? No, seriously. We should get the chair cover on Raverly, I tried to put in in my projects a while back and could not belive that no one had started this project yet. It made me so sad. Oh the deniminess of it all, I’m in a swoon. 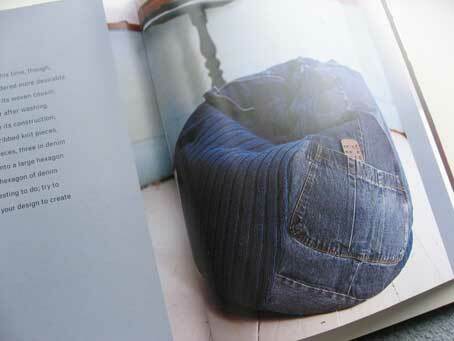 The denim bean bag is available as a free PDF to Rowan club members or the knitters who know Rowan club members. Not that I am advocating the sharing of a free pdf. Knitware designers need their income. 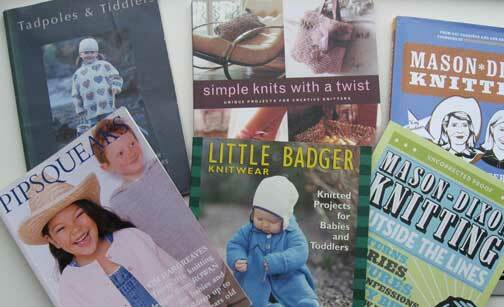 I buy many knitting pattern books, really, I support my knitware designers. Kay, great minds think alike …. a few years ago I was all fired up to knit an aran chair cover, the pattern was in Interweave and the victim chair was/is available through Ikea. hmmmm, I am going to go dig up that pattern right now — could this be the return of the Knitting Mojo? I have an Alice St*rm*re book (Aran knits? I think) that has an Aran (or gansey? sheesh, I am ignorant) sweater from Rowan denim, and I want to make it someday. Wool is kinda warm for me, so I thought the cotton denim yarn might be Just Right. Now I an all fired up about it again. The chair cover is awesome. Simply mind-boggling. You have absolutely convinced me I have to make something in Denim. I really hadn’t thought about it before. Now, I’ve got to add something else to my ‘TO DO’ list. Hmmmm, I wonder what it will be. Probably not the chair cover! What I want is a preview of the new book like you have of the old. :o) Lets talk about that! That has to be the ultimate post on denim knitting. The blog world can retire it as a subject, future generatons will be reading it (from their brain scan machines, i’m sure they won’t need laptps or broadband connections). Anyway, let me know when you get that chair knit up. I’m planning to come by wearing my emery board capris and will sit all fidgety-like to give it the finishing touch for you. I had forgotten about the frock. Gosh. Where does the time go? That has to be the most comprehensive denim knitting post ever. Future generations will be referencing it, reading it directly from their brain scan thingies (they won’t need laptops and broadband connections). Wouldn’t the denim chair require safety flags with huge warnings on it that scream “DO NOT EVEN CONSIDER SITTING IN THIS CHAIR IN LIGHT COLORED CLOTHES UNLESS YOU WANT A PALE BLUE FANNY?” Just a thought. So, how much stock do you have in the companies that sell this denim stuff, anyway? Just curious. I see I’m not the only one about to run out and make a precipitous denim yarn purchase. Oh, my, now I have to go buy that stuff and knit a chair cover out of it! gale, I love the tush line. The Alice Starmore book mentioned in a previous comment, which features a couple of patterns in Rowan Tweed *and* is still in print, is “Fishermen’s Sweaters”. Really deserving of a place in your impressive Denim Library, Kay. The silver lining of those huge sizes in the first Denim booklet is the enormous personal satisfaction of knitting a size Child 4-6 turtleneck for myself that fits great! ok, as always, I look at the pretty pictures first, as I’m more visual than anything, then read. Lordy, all I saw was the cover of a soon-to-be-released book! Be still my heart! So… will there be a book tour, and could we talk you into making a stop or two in NC??? You are an evil minx, Kay. After reading yesterday’s post, I found myself wandering over to Elann to see how much their denim yarn cost! And I’ve never had a desire to knit with denim. And now I feel that I am missing out by not buying some. I think I’ve calmed the shopping monster for a few minutes, but I fear the next time I am near my computer and my credit card simultaneously. I have managed to never see that chair, therefore never wanted that chair, and now you just had to show me that chair. LUV the chair. Denim would be perfect. I may cheat and do a denim slipcover and only knit the seat cushion. And don’t be mad, but I already have the perfect sad old chair in need of a makeover. When I read 1000 words about denim, I think, “WHO is mad?” Must be Kay. Thanks for the walk down memory lane with the squares and the denim library and all. But I covet that chair cover. Not enough to knit it, but I do covet it. OMG. Kay you MUST knit that chair slipcover! I can’t wait to see it in denim!!! 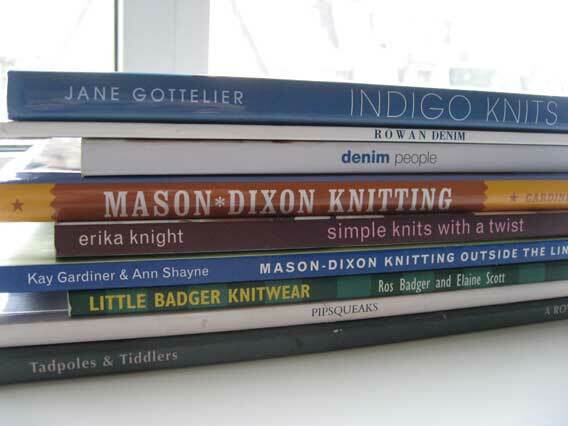 Thank you for adding to my wishlist of books…wonder how much ebay has Denim People for right now? Now I want the chair cover too! I don’t think it’s all that outrageous a proposition. It would be like an afghan with a lot of shaping. I love shaping – would probably go more for one with a lot of short rows over a lot of intricate cabling. Some body ought to start a group, it would make a great KAL. However, it would be very important to make sure it was well washed before you used it or the denim would stain all your clothes. Remember Frye boots? My Fryes were ruined by new jeans, 19787 being before prewashed. Yeah, your new book. I have to wait until September 16th though and that is going to be so hard! My 7 yr old daughter, Emma was looking over my shoulder and said, Huh?!! They knitted a chair? How could they knit something that big!